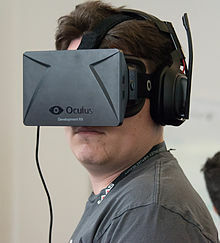 ^ 1.0 1.1 Happy Birthday to Palmer Luckey, creator of the Oculus :D<3. Reddit. 2013-09-19 [2014-06-15]. ^ 2.0 2.1 2.2 2.3 2.4 2.5 2.6 Martens, Todd. Palmer Luckey's Oculus Rift could be a virtual reality breakthrough. Hero Complex: Pop Culture Unmasked (Los Angeles Times). 2013-06-08 [2014-06-15]. ^ 3.0 3.1 3.2 People | Oculus Rift - Virtual Reality Headset for 3D Gaming. Oculus VR. [2014-06-15]. （原始内容存档于2014-03-26）. ^ 4.0 4.1 Freeman, Lary. Oculus Rift Kickstarter campaign: comment by grandfather. [2014-06-15]. ^ Corporate Officers, Directors and C-Level Executives for OCULUS LLC. Wysk. [2014-06-15]. （原始内容存档于2014-06-19）. ^ 6.0 6.1 6.2 Lang, Ben. Q&A With Palmer Luckey, Creator of the Oculus Rift. Road to VR. 2012-10-16 [2014-06-21]. ^ 7.00 7.01 7.02 7.03 7.04 7.05 7.06 7.07 7.08 7.09 7.10 Purchese, Robert. Happy Go Luckey: Meet the 20-year-old creator of Oculus Rift. Eurogamer.net. 2013-07-11 [2014-06-15]. ^ 8.0 8.1 8.2 Whitehouse, Kaja. Oculus founder, just 21, 'never imagined' $2B Facebook deal. New York Post. 2014-03-26 [2014-06-19]. ^ 9.0 9.1 9.2 9.3 9.4 9.5 9.6 Peckham, Matt. The Inside Story of Oculus Rift and How Virtual Reality Became Reality. Wired. 2014-05-20 [2014-06-15]. ^ Daily 49er : Staff. Daily 49er. [2014-09-08]. ^ Graham, Jefferson. Talking Tech | The real world of Oculus VR founder Palmer Luckey. USA TODAY. 2014 [2014-06-19]. ^ Luckey, Palmer. Oculus "Rift" : An open-source HMD for Kickstarter. MTBS3D. 2009-08-21 [2014-06-19]. ^ 14.0 14.1 14.2 14.3 陈一斌. Oculus VR——虚拟现实背后光荣之路. ifanr.com. 爱范儿. 2014-05-23 [2014-11-17]. ^ 15.0 15.1 解密Oculus VR：90后輟學者把公司賣了20億美元. 北京新浪網 (新浪). 2014-03-26 [2014-11-17]. ^ 16.0 16.1 Palmer Luckey on Palmer Luckey: A VRFocus Interview. VRFocus. 2014-06-04 [2014-06-19].